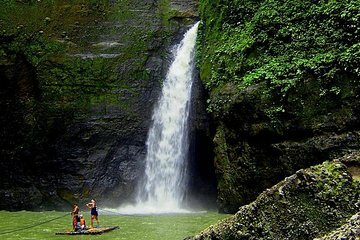 Ride over rapids in a dugout canoe to Pagsanjan Falls, surrounded by the lush landscape of Pagsanjan Gorge National Park. You can swim in a hidden cave and enjoy lunch while you’re entertained by live music. Hotel pickup and drop-off are included on this exciting day trip from Manila and Makati, led by a guide. Meet your guide during morning pickup from your city hotel in Manila or Makati, and relax during the 2.5-hour drive south to Pagsanjan Gorge National Park, where you'll embark on a scenic boat ride aboard a dugout canoe called a banca. En route to Pagsanjan, if time allows, your vehicle may stop at a local village where you can taste local delicacies including balut (fertilized duck egg. Then, enjoy a refreshing coconut drink before you slip on your life vest and float through the narrow Pagsanjan gorge lined with lush tropical vegetation. Two expert boatmen skillfully maneuver your craft upstream to Pagsanjan Falls. You’ll dock at a natural pool below the majestic cascade, and take an optional raft ride to a hidden cave, where you can swim and explore—so prepare to get wet! Conclude your full-day tour with lunch at the visitor’s center. Listen to a live band play music during your meal. Afterward, you’ll be taken back to your hotel. Experience was brilliant although be prepared to get majorly wet and ensure you have amply tip money as the locals can be a bity pushy! Rick and Grayline were excellent! We enjoyed every minute of our trip from Manila to Pagsanjan Falls. The falls were nice, but the close to 200.00 US is a lot, you're better off taking public transport to get close to the falls and then, purchase a boat ride for 20US. It was so good to get out of Manila and see some green! The Falls are tremendous and the roar as you approach them is amazing. Make sure you wear old clothes and old trainers as you will get very wet! The meal afterward was beautiful too! I would highly recommend taking this tour while visiting this area of the Philippines. 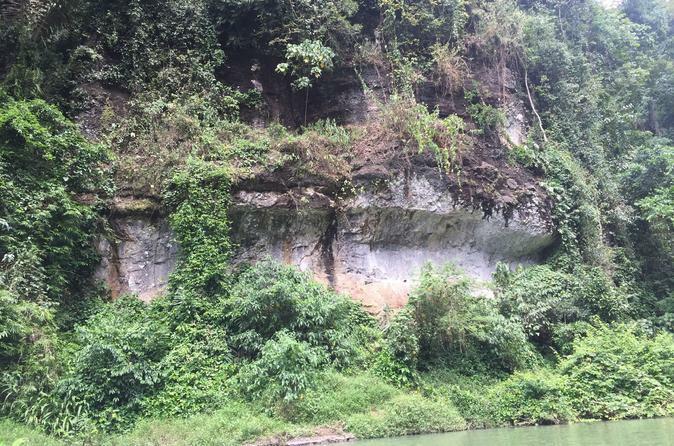 The boat ride to Pagsanjan Falls was awesome and the scenery was beautiful. The boatmen do a hell of a job getting you to the falls and back. Kudos to them. The tour guide and driver were super. The scenery was amazing and the food was good. The tour guide had told us what the daily earnings were. We took this to be a hint as to what to tip the boatmen. We attempted to tip the boatmen a full days earnings each. The boatmen became aggressive and were asking for more. Its not a lot being honest and I wasn't concerned from a safety perspective but it just really left a bad taste in my mouth about the whole trip. I gave the feedback privately to Viator but never heard anything back. Even though it rained this was a very fun trip down the river to see the Pagsanjan Falls. The lunch that was included was very authentic and delicious as well. The entire trip was really good. However, the price is too expensive as the locals says with this price, you can pay for 2. Not forgetting you need to pay for the boat driver tip of about 10USD each.